1943: Thirty-eight players report for spring drills during wartime. 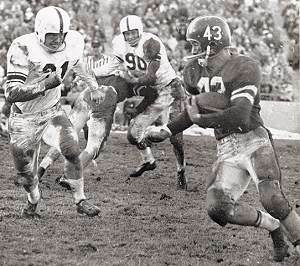 «1973: UConn selects Larry Naviaux, a halfback for the Huskers from 1956 through 1958, as head coach. Photo shows him carrying the ball in a 1957 game. 1988: A bill that would make NU football players paid state employees wins first-round approval in the Nebraska Legislature. 1993: Former Husker safety Tyrone Byrd suffers a broken back in a New Mexico auto accident. 2003: Position changes for three defensive players are announced ahead of the start of spring drills. 2008: Bo Pelini indicates seniority won't count for much as players get evaluated in upcoming spring drills. 2013: The East Stadium expansion makes the sellout streak less of a sure thing.